Gevlon has been talking for quite some time about gear being a fallacy, the whole clearing Ulduar in blues and looking at clearing all WotLK content in blues is pretty badass. I find it somewhat inspiring, and I've been thinking about doing this for a while but keep deciding not to. Today I did it. 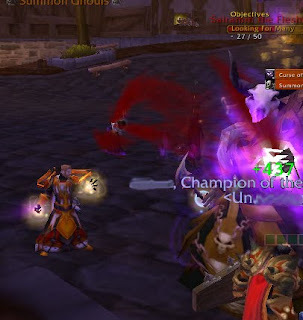 I was running random heroics to help a friend of our guild gear up an alt so she can play with us, there's no harm in running heroics to do so, it's pretty darn easy. And we get into our random instance, Heroic Culling of Strat with a pair of people from another server. One of the non-server players commented that she felt bad being around people in such good gear compared to her own. I exclaimed unto her something to the extent of, "Gear is a fallacy. Did you hear some people cleared Ulduar10 in blues? Hell, I'll do the rest of this instance in my RP gear." So I slapped on the RP gear (6/8 Paladin T2 + engineering tank goggles + Hand of Rag), then slapped on my regular healing mace, my shield, a belt (I'm missing the Judgement belt), and kept right on healing. One of the PUGs said that my average iLevel in my RP suit was 165. For reference, that's about the average level of loot from Violet Hold regular. Mind you that I wasn't wearing a healing helm and Paladin T2's itemization is absolute crap, so 165 is generous, it was probably much lower when it comes to beneficial stats. We did just fine. I did slap on my regular suit for the gauntlet simply because I wasn't sure if the pugs would get agro, nor if I had enough power to heal one of them through undead agro. We had... 6 or 7 minutes left on our timer. A wipe would have lost the drake, but since one of them had mentioned interest in getting a mount, implying that they'd not been in groups that had completed the timed run before. One of them did get the dragon and I chatted it up with them briefly afterwards. I invited them to come chat with me on our server and said I'd try to /friend them when the battlenet changes go live that will let us talk across server. Regardless of if I ever get to talk to them again or not, I'm fairly sure that the heroic run where one of them got a drake and got healed by a crazy belf in T2 is one they won't soon forget. I'm thinking I should do a whole bunch of pug runs in that gear just to record the reactions... I'll probably grab a guildling or two so I can't be vote-kicked. I'll probably do the gear with a few tweaks (enchants, a slight regemming so I'll still have my meta bonus (2% int) and wearing the 232 judgement helm instead of the level 72 epic goggles).